Harissa, a North African condiment, most associated with, but not exclusive to, Tunisia. 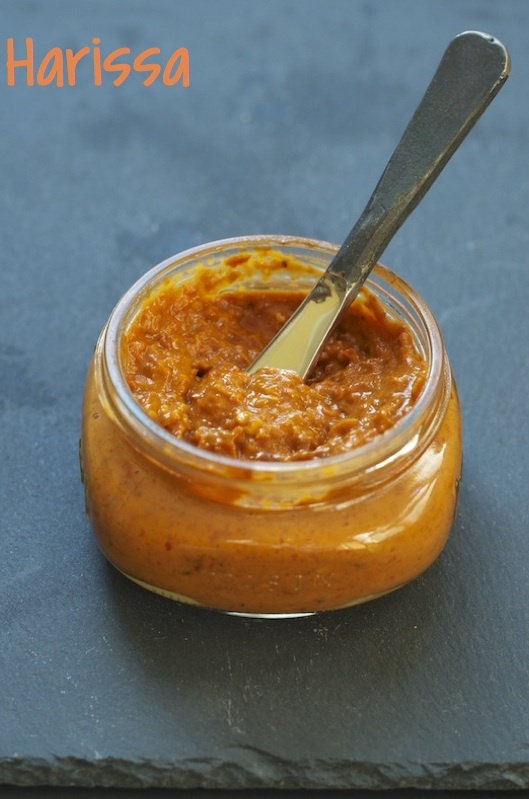 There are so many versions of Harissa within North Africa, not to mention the similar Yemenite Schug and the South East Asian Sambal. The purest, most basic version of Harissa is made with rehydrated dried red chili peppers, garlic, salt and oil to seal and preserve. Great on sandwiches, fish and a dabble to jazz up soups, just to name a few uses. I love the kick my version got with that beautiful orange color, achieved by emulsifying the olive oil with the ingredients in the food processor. Add dried red chilies into a large bowl and cover with boiling water. After 1/2 an hour, drain the water. Line the bell peppers skin side up on a parchment paper lined cookie sheet. Broil until skin is completely charred. With a stainless steel spatula, immediately remove to a large ziploc bag and seal well. Be watchful not to get burnt from the steam. Peel when cooled down. Add the caraway, cumin and coriander seeds to a skillet on a medium heat. Toast for a few seconds until you smell the aromas being released. Be careful not to burn seeds. Process the toasted spices in a mortar and pestle or a spice grinder until you get a powder. Add all the ingredients, except the extra oil, for sealing into a food processor and whiz until you reach a smooth consistency. Scoop into a jar and cover the top with oil to seal. Secure with a lid. Make sure to replenish oil for sealing after each use. Keep refrigerated for up to two months properly sealed with oil. *I used chili Japones I had in my pantry but you can use Ancho chills for milder, lesser heat, or a variety of red chills. I enjoy Harissa on Pizza and I use it as a spread too. Some are really hot, the first time I had it, smoke came out of my ears, LOL! I like the homemade version it always tastes better and you can control the heat. Thanks for the recipe dear! Oh spicy.. but sounds really great. True, spicy. Can tone it down with Ancho chili instead. Will be more smokey but much less heat. Wonderful! Harissa is a deliciously spicy sauce. I love to put it in sandwiches and omelets. Great idea on omelets, Rosa! one of my all-time FAVORITE condiments Shulie - toasted cheese is a thing of glory w/the addition of harissa! Harissa rocks! Sometimes I wished I grew up with this delicious smoky paste. thank you for sharing Shulie. As long as you know it as a grown up. :) My pleasure. There are so many variations! Mmmm that's so, so good! We make something very similar called Ajvar with roasted red peppers. i've wanted to make this for years...gonna do it soon! Johanna, Let me know how it turns out. Interesting! I've seen recipes calling for harissa but never an actual recipe for it. Good to have! שולי אני חייבת להגיד לך שלפי התמונה זה נראה ממש אבל ממש טוב!! אני אגלה לך סוד - עוד לא טעמתי אף פעם חריסה. במשפחה שלי דווקא אוהבים חריף (חוץ מהחצי שלי שרגיש ברמות הסטריות לחריף), ואני יודעת בדיוק למי להעביר את המתכון שישמח מאד להכין את זה. This dip looks so tasty, I love the vibrant color! I know, right?! It was quite by accident. If I didn't emulsify the oil with the condiments it would be more smokey red. What perfect timing I wanted to pick up some Harrisa at the store yesterday but they were all out. Time I try to make my own! I love Harissa! I made a few years ago, but lost the recipe, so I'm so glad you posted this.